The taxi hailing business has been growing rapidly locally, which has attracted several players including Uber, MaraMoja and Mondo Ride. Tradition taxi services have also been mastering the shift as witnessed with the newly released app by Pewin Cabs. The space has also seen exits as seen with EasyTaxi, which opted to concentrate on its home market in South America despite having a presence in 402 cities across the world. 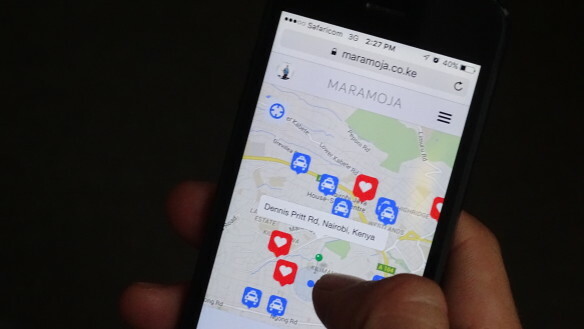 MaraMoja was launched by Jason Eisen about a year ago following bad experiences with taxis whenever he visited Kenya in his previous employment. Users can hail a MaraMoja cab through its Android app, a mobile-optimized web app that works on iOS and on the web. MaraMoja’s key differentiator is its trust engine, where the app sifts through your network to identify your friend’s favourite drivers and if they are near your and then sends them to you to complete your ride. MaraMoja has made significant inroads locally including the addition of corporate offerings for its clients besides launching a bodaboda offering, which was shelved for later. The firm has now announced new offerings for the market. In partnership with Exec Cars, the firm will offer on demand luxury services from the app. Users will on logging into the MaraMoja App see to options, one for taxis and the other for Luxury. On choosing luxury, Exec Cars will avail its fleet of cars from Audis, BMW, Chryslers and Range Rovers for completion of the ride.The ride will be priced at 3X the normal taxi pricing, with prices available through MaraMoja’s price map. The vehicles will be available at specific timings and places, which the firm will announce. Mara Moja has also revamped its web app giving it a cleaner design aimed at enhancing user experience. The web app adds the new luxury feature, while offering corporate clients a better and enhanced dashboard to monitor expense and employee rides. Users will also have the ability to book a ride for other users, upon which an SMS notification will be sent to them, where thy can track the driver as he comes to complete the ride request. MaraMoja also announced a partnership with The Hub Mall in Karen, where it will avail its services to customers.